ABC Extra – Atonement: Universal or Limited? With these words, Paul offers a simple, yet eloquent, definition of the doctrine of the atonement. The atonement is God’s reconciliation of the world to Himself through Christ. Yet, this definition has caused more than a little debate over the years. So then, when the end has been restored to the beginning…so that when all feeling of wickedness has been removed, and the individual has been purified and cleansed, He who alone is the one good God becomes to him “all,” and that not in the case of a few individuals, or of a considerable number, but He Himself is “all in all.” (Origen, De Prinicipiis, 3.6.3). Origen’s borrows the phrase “all in all” from 1 Corinthians 15:28 to assert that God will not just save “a few individuals, or a considerable number,” but all people! Everyone will be saved! This is the doctrine of universal atonement. And it is a false doctrine. Not all people will be saved. The second error that has crept into the doctrine of atonement is that of “limited atonement.” “Limited atonement” notes that, even though Paul writes “that God was reconciling the world to Himself in Christ,” not all are saved. Some are cast into hell (cf. Revelation 20:15). Thus, “limited atonement” teaches that God did not reconcile the whole world to Himself in Christ; rather, He reconciled only the world of the elect, or those He has chosen for salvation, to Himself. Indeed, this is the teaching of many modern day Calvinists, although it is debatable as to whether or not Calvin himself taught this. So what is the way through these debates? Is universal atonement or limited atonement correct? Actually, neither is correct. Lutherans have long made a distinction between objective justification and subjective justification. Objective justification states that when Christ died, He did so for the sins of the whole world. God sought to reconcile the whole world to Himself in Christ. Subjective justification notes that Christ’s objective work on the cross must be received subjectively, or personally, through faith. This is what the Lutheran Confessions call “personal faith”: “Personal faith – by which an individual believes that his or her sins are remitted on account of Christ and that God is reconciled and gracious on account of Christ – receives the forgiveness of sins and justifies us” (Apology IV:45). In other words, the Lutheran confessors teach that Christ’s objective work on the cross does you no good if you don’t trust in it for your forgiveness of sins, life, and salvation! This is why the Scriptures contain constant calls to personal faith (e.g., Romans 10:9-10). Both objective and subjective justification are needed. Subjective justification is needed because it invites us to have faith and reminds us that without faith, we will be damned (cf. Luke 8:12). Objective justification is important because it reminds us that Christ’s work on the cross is not just for some, but for the whole world. Indeed, it is for you! God not only reconciles the world to Himself in Christ, He reconciles you, for He loves you. This is the true doctrine of the atonement! Entry filed under: ABC Extra. Tags: Apology of the Augsburg Confession, Limited Atonement, Objective Justification, Origen, Reconciliation, Subjective Justification, Universal Atonement. Hi, Zach! You just know I couldn’t let an excellent post like this one go without comment! Another great passage for Christ’s death for all sin is 1 John 2:2. I wonder: was Origen’s forerunner Marcion, with his beliefs on atonement? Different subject. 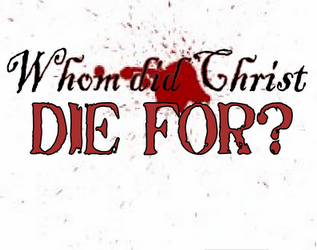 Limited atonement: Christ died only for those He intended to save. While this the battle cry of Calvinists, it is a circular argument. Additionally, it eliminates grace entirely and place everything squarely on judgment – those whom God, by His judgment, intended to save. The father of this thinking isn’t really Calvin; it’s Augustine. In the controversy with Pelagius, and I can’t remember the exact citation, what you say in your post and what I’ve said here are are included. Because atonement is a dirty, bloody business, it stands to reason that the correct teaching on atonement would be filled with tension. The Confessions note this, as you quote from the Apology. Yet, sinful man being sinful man, there is the desire to place things into a nice, neat package. Instead, our Lord Jesus endured the cross for all sinners, yet they are made alive in faith that joins one to Christ the crucified. Interesting, if not terribly persuasive post Zach. Simply put, the view you advocate is no less “limiting” with regard to the atonement. Of course, the difference between your (and Lutheranism’s) view and that of the Calvinist/Reformed view is that your view limits its efficacy, whereas the Reformed view limits its extent (or application). In either case, the atonement is limited; it’s simply a matter of one’s perspective determining the nature of it’s limitation. Or, put another way, it seems to me that Lutherans have a bridge that is very wide yet doesn’t completely span the chasm that exists between God and sinful man, whereas the Reformed bridge, while much narrower, does, in fact, go all the way across. Christ came to save, not to make it possible. I’m under no illusion that I’m telling you anything about which you were not already aware, but who knows? Maybe a visitor to your blog will appreciate a view, if not from “the other side”, then perhaps one from a different perspective on the same (i.e. Christ’s) side. Thanks for providing a forum for this type of discussion. I come from a Reformed background. Luther’s writings defending our Lord’s words in the sacrament of Communion is one of the most important illuminations a Christian can know concerning that in which our faith consists. In Communion the person and promise of Christ become one, indwelling the believer. Here, our faith in Christ is synonymous with our faith in the Word. Coming from a Reformed perspective, this has been a most blessed and overwhelming realization. Leaving the Reformed camp, I desire fellowship with like minded believers. However, this new orthodoxy among contemporary Lutherans and their emphasis on ‘objective’ justification creates a real quandary. (I know that last sentence immediately caused you to set up a defensive fence, please hear me out.) How can I say ‘new’ orthodoxy? The LCMS and WELS have found it necessary to form study groups to further clarify their denomination’s position on justification. As a result now thousands, if not hundreds of thousands, of congregants are bound to their study groups findings concerning ‘objective’ justification, as if to say, the Book of Concord was not sufficient, the original Reformers did not ’emphasize’ this new understanding of justification sufficiently. I know your mind will immediately retort,”Did I not properly cite in my post a quote from the Book of Concord?” Well…no, you drew an inference defending the new contemporary position. I have much more to write. However, I don’t know if further comments will bear fruit or be engaged or if this is even the forum to discuss such foundational matters. The whole matter, as I see it, revolves around a Christian’s desire for assurance of salvation. This new orthodoxy tells me to find it in the forgiveness of all men’s sins, objective justification,” just conjure up a little faith and you can be assured, subjectively justified,”not recognizing the delirium caused the sheep in this insurmountable paradox. The Reformers emphasized faith in the Word, Christ, His promises, here is our justification.